"If you need to patch up your soul, or restore your faith in humanity, BRAVO 25: Your A.I. Therapist Will See You Now is just the right medicine"
Amber the A.I. therapist is here. Broken hearts, addicts in recovery, a polyamorous lesbian awaits the arrival of Superintelligence, a grieving savant who likes donuts.... Wait. Someone needs a piece of somebody’s liver? Maybe it's time to return to our breath. In BRAVO 25, winner of the ENCORE! 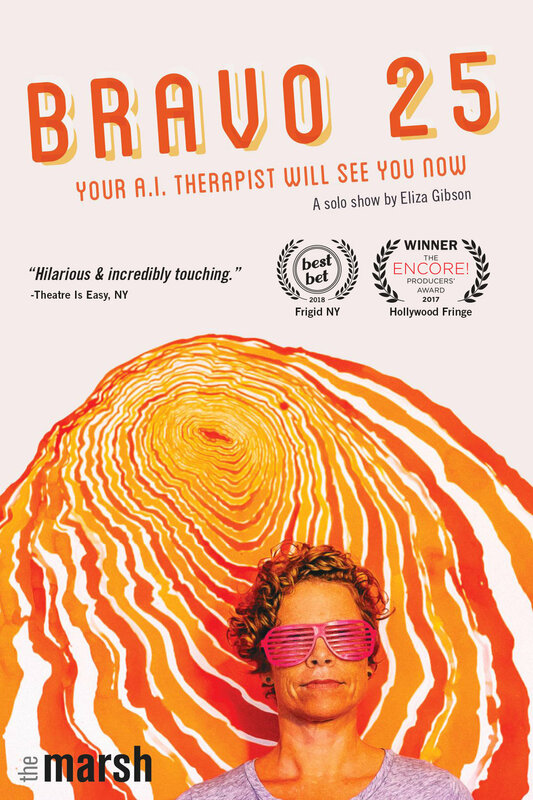 Producers' Award 2017 at the Hollywood Fringe Festival, and named "Best Bet" by Theatre is Easy, NY in February 2018, queer artist Eliza Gibson draws on her real-life experience as a social worker and therapist to bring to life an A.I. avatar and six humans in a support group unlike any you've ever seen! The show premiered at the Rogue Festival in Fresno in March 2017, and was produced by Beyond Words at Stage Werx Theatre in April 2017, had an extended run at the Hollywood Fringe Festival in July 2017 and a run at FRIGID New York in February 2018. An excerpt was selected to compete in SF's PianoFight’s ShortLived competition in February 2016, and in January 2018, the show was selected for a Marsh Rising performance at The Marsh in San Francisco. Like Eliza's solo show, And Now, No Flip Flops? !, BRAVO 25 is directed by David Ford. for And Now, No Flip Flops?! Meet Eliza: divorced with an ex-wife she couldn't legally marry and cross-country co-custody of their 72 pound dog. Her search for a way to breathe again takes her from indoor sky diving to drill team tryouts, to making fish flashcards and yes, to losing her favorite flip flops. Directed by David Ford, And Now, No Flip Flops?! premiered at The Rogue Festival in Fresno in February, 2015. The SF premiere was in July 2015 at the SF LGBT Community Center. Other performances have included festivals in NYC and Providence, RI. Praise for And Now, No Flip Flops?! "Mark of a good show? Laughter, tears, thunderous applause." "Eliza's brilliantly performed story about life after lesbian divorce is ironic and timely. Her ability to physically become multiple characters is captivating. She shows us just how unbearable grief can be for all of us - queer, questioning, gay and straight - and that somehow, we all do make it to the other side." " Eliza gets to the core of the experience of grief and does it with a fresh, unscripted humor. We reach with her a place that is familiar to all of us – trapped. In one moment she yells, 'I just want something to change!' And then it does. We are astounded with her. " Eliza Gibson is a queer artist, writer and solo performer based in San Francisco. Trained as a classical pianist and a drummer, Eliza wrote and performed her first solo show –Dialogues with Madwomen – in 1995, after returning to the US from Yugoslavia, where she had been a humanitarian aid worker. She also wrote the narrative for Memories Do Not Burn, a documentary about war orphans and refugees featuring the voice of Sarah Jessica Parker. A clinical social worker, in 2008 Eliza led the start-up for Clinic by the Bay, a free health clinic for working uninsured adults, where she served as Executive Director until 2015. Eliza currently works at a health technology company, which may or may not have provided inspiration for BRAVO 25.